The Siemens Foundation announced today this year’s semifinalists and regional finalists in the Siemens Competition in Math, Science and Technology. Ten Harker students, four finalists and six semifinalists, were among the students named. Harker students submitted a total of 24 group and individual projects for the contest. 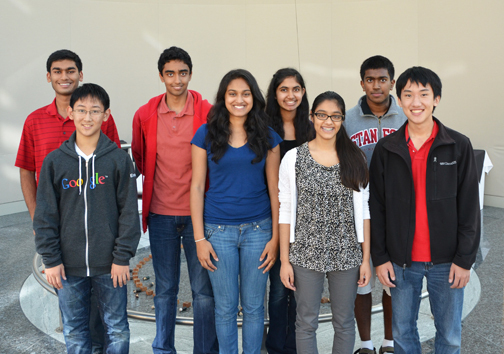 One third of the finalists from California are Harker students. They are: Ashvin Swaminathan (individual), Paulomi Bhattacharya (individual), Rohan Chandra (individual), all grade 12, and Zareen Choudhury (group), grade 11. This year’s semifinalists are: Andrew Luo (individual), Kevin Susai (individual) and Ravi Tadinada (group), all grade 12, Anika Gupta (group) and Saachi Jain (group), both grade 11, and Andrew Zhang (group), grade 10. Each of the regional finalists were awarded $1,000. All of the students spent many hours doing advanced research and analysis for the projects they submitted for the contest, which has thousands of entrants every year.